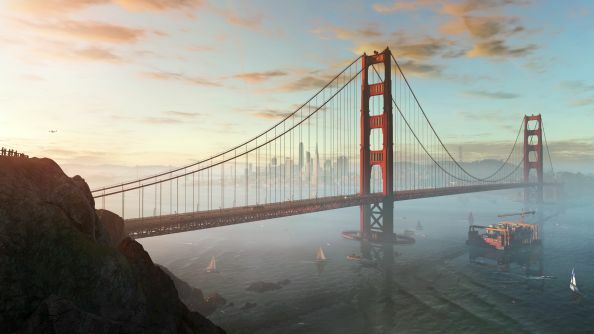 Watch Dogs 2 has a lot of pressure on it to succeed, especially after the first game was met with such mixed reviews when it released May 27, 2014. The premise was there, but the gameplay, world and protagonist all failed to deliver quite as expected. Watch Dogs 2 then, is Ubisoft’s chance to give the hacker franchise a proper kickstart and cement its future. Interested in the biggest titles on the horizon? Check out the best upcoming PC games. This time around the action is taking place in sunny – and occasionally super-foggy – San Francisco. 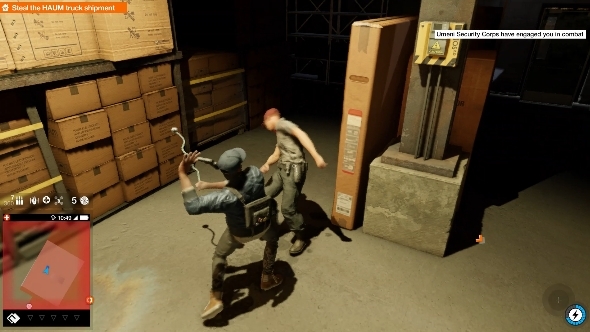 Players won’t be lumbered with taking the reigns of moody ol’ Aiden Pearce but will instead be introduced to new protagonist Marcus, which will make using the mass of new hacking tools a bit less serious and a bit more fun. 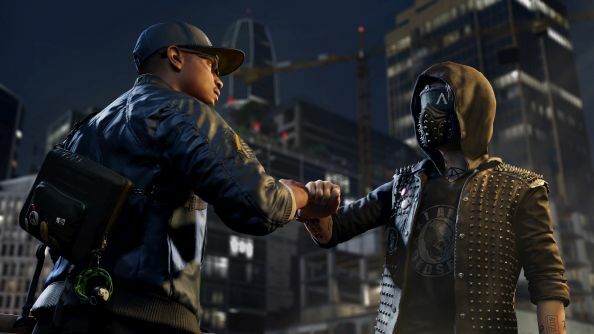 While we’ve only officially known about Watch Dogs 2 since the run-up to E3 2016, there’s a veritable databank of info on it, from its release date and gameplay to its reveal trailer and pre-order deals. No need to wait years after a dazzling (and controversy-courting) E3 demo this time around, because the Watch Dogs 2 release date is November 15, 2016… on console. The PC version’s due slightly later on the 29th. Our hopes are that Ubi have been working on the game on the hush-hush for a while now, hopefully limiting the odds of a delay. But it’s 2016 and game’s ain’t what they used to be etc. so who knows? The proximity of reveal to release does maximise the chances that its current gameplay footage will match the final game. We’ll ignore the collection of teasers and half-reveals that marked Watch Dogs 2’s stumble into existence. Instead, we’ve got a lengthy Watch Dogs 2 gameplay trailer, which tells you pretty much everything you need to know, as well as a couple of other showcases to whet your appetite. Firstly, let’s meet protagonist Marcus Holloway and check out sandbox San Francisco. There’s also an online trailer to check out, complete with online invasions, bounty hunting and co-op exploration. If it’s a Run The Jewels-backed, heavily produced trailer that attempts to make hackers and San Francisco out to be the coolest combination since sour cream and chives, then this trailer is what you’re after. Finally, you can watch Jeremy’s dog watching the Watch Dogs 2 trailer. Dogs Watch Watch Dogs – It’s pretty meta, and pretty cute. 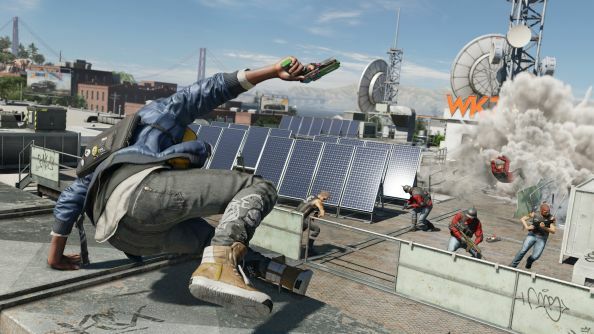 Watch Dogs 2 carries a number of the core gameplay concepts from the original into its new sandbox, including hacking minigames, driving, parkour, gunplay, melee combat and stealth. It’s essentially the same mass of ideas and individual systems present in other triple-A titles like GTA V, but given a distinctly less maniacal coat of paint. Given the first Watch Dogs’ somewhat restrictive hacking tools, it makes sense that Ubi have taken the franchise’s main selling point and given it a genuine overhaul. 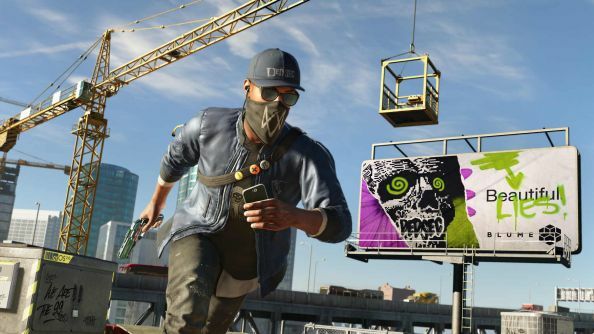 Rather than a limited selection of on-the-fly abilities like raising and lowering bridges and bollards, Watch Dogs 2’s gameplay allows players to remotely drive cars and operate machinery, hack other people’s phones, manipulate traffic signals and control all manner of drones and RC-like toys. The options aren’t simply on/off anymore either: now the player’s distance from their targeted device alters what options are available to them. There’s also numerous options for what you can do with each hackable item. For example, a targeted person’s smartphone can be set to ring to cause a distraction, call the police to have them arrested and moved out of the way, or simply hacked to syphon money from their bank account. In short, hacking this time around is a more focussed procedure and not a quick way of getting rid of any pursuing cops. This becomes a central part of the gameplay in many missions, to the extent that some can even be completed entirely through the use of hacks. Levels have been designed with multiple approaches in mind, making stealth runs possible as well as violent massacres. And then there’s side quests that really embrace the meme-fuelled internet humour the game has adopted. Fancy a Crazy Taxi-like side quest line? Watch Dogs 2 has you covered. 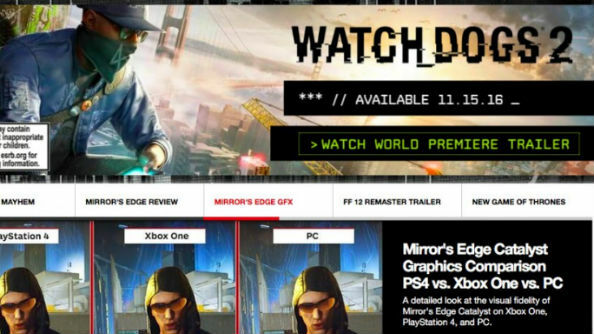 The first Watch Dogs game revelled in destruction, which sort of made hacking seem a bit lame. Sure you could send the odd police car careening into the Chicago River, but after blowing 20 baddies away with grenades and assault rifles it doesn’t stand out much. While going full Michael Bay on your enemies in possible in Watch Dogs 2, Ubisoft have given players the option of playing the game non-lethally. That means using a taser instead of a gun, choking out guards rather than bludgeoning them to death and using the environment to your advantage. With many, many more hacking and movement options open to the player, there will be multiple ways of completing every single mission. Likewise if you’re fine with killing but don’t fancy getting the blood on your hands, you can have a remote-controlled car run down a guard instead of getting behind the wheel yourself. Online play is entirely optional, but everything that players do will contribute to progress made in the solo game – be it gaining followers for DedSec or unlocking sweet, sweet gear. Head to Steam and you’ll find three Watch Dogs 2 pre-order options. There’s a standard pre-order option for Windows that’ll set you back $59.99/£39.99. For that you’ll get the standard game as well as a Zodiac killer-themed extra mission. The next level of pre-purchasing commitment comes in at $69.99/£54.99 and adds “two Deluxe Packs full of valuable extra content” – we’re guessing that means an array of in-game items. The priciest pre-order, if your love for Watch Dogs 2 knows no bounds, is a gold edition for $99.99/£69.99, which gives you access to all DLC and add-ons from the game’s Season Pass as well as the Deluxe Edition’s content. 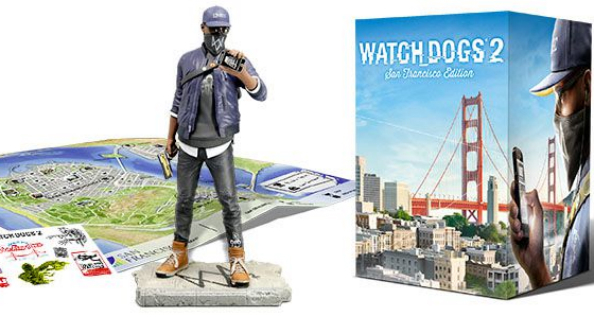 There’s also a San Francisco edition which comes with a Marcus figurine, a map and some laptop stickers, as well as some unique skins and in-game items. It’s $69.99 on Amazon, which is a steal considering how expensive models of young men wearing snapbacks can be these days. Ubisoft might have abandoned both Aiden Pearce and Chicago for the sequel, but the two games are connected by more than their gameplay. The ctOS which was adopted in Chicago, connecting everything and everyone (and making it a hacker’s paradise in the process), has also reached San Francisco. The company behind ctOS, the Blume Corporation, also upgraded it to version 2.0, an upgrade that has come with its fair share of problems for the citizens using it. While no major plot details from the game have been revealed we do know that the story will revolve around Marcus and DedSec’s attempt to bring down ctOS and make people aware of the evil behind it. Sorry, Aiden Pearce. Tragic as your life was, you’re boring and grumpy, and nobody wants to play with you anymore. Marcus Holloway is the Watch Dogs 2’s protagonist, he’s a young, smart hacker with plenty of personality and a knack for driving, shooting and hopping over fences. He also heads up DedSec, a hacktivist collective working their socks off to take down the controlling elites of San Francisco. He’s in his early twenties and he’s having a blast, which is a very different proposition than the first game’s tortured Batman figure. A young and bright Oakland resident, Marcus was the victim of racial profiling and accused of a crime he never committed, which inspired him to try and take the operating system down. The big question: will it run on your PC? We’ve got the minimum and recommended Watch Dogs 2 systems requirements for you to check for yourself. By the looks of things, Ubisoft have been hard at work on the PC port of the game, as there are heaps of additional features that accompany their released system specs.